4A Sub-State play was on stage Thursday evening at WHS!The 13-6 WHS Lady Crusaders hosted 10-8 Wamego - the winner would advance to the SUB-STATE Championship Game Saturday evening at Ulysses HS, the Lady Tigers downed the Buhler Lady Crusaders Thursday 43-31 at Ulysses to earn their home slot in Saturday's Championship Game. Wamego will be their opponent, after a CLOSE victory over our ladies, final score Wamego 42 Wellington 40. Congratulations to our Lady Crusaders for a very good season (13-7) - a season that exceeded expectations in many categories. We all knew these young ladies were scrappy and determined - many times throughout the season, that became very evident. Congrats again on making your mark, especially you Seniors! Thursday was also SENIOR/PARENT Night, a ceremony planned twice before but cancelled due to weather. "8" Basketball & Wrestling Seniors were on hand (with their parents), for the ceremony prior to tipoff. Great bunch - will truly be missed! The Varsity and JV Lady Crusaders hosted Augusta Friday at WHS - it was HOMECOMING and our ladies each chalked up W's for the occasion! The Varsity Lady Orioles came in at 8-6 and both teams battled it out until the very end...final score AHS 47 WHS 48!! In the 4A West Sub-State Division, our Ladies are presently in 7th out of 18 teams...that weekly updated bracket can be found at this link. It's Mid America Classic time at McPherson Roundhouse and our Lady Crusaders took to the courts Thursday afternoon against the Lady Indians from Manhattan. If you throw out the 2nd and 3rd qtrs, this game ends in a tie.. the final score was Manhattan 81 Wellington 51. The Lady Crusaders held their own and played solid basketball during that 1st qtr and only trailed by 2 when it ended. The Lady Indians awakened apparently and went on a 50-20 run over the next 2 qtrs and the deal was sealed. Tall and strong, the Lady Indians pulled away for the eventual 30 pt. victory. Manhattan out rebounded WHS 38 to 26. The Lady Crusaders did sink 14/14 FT's the 2nd half, but turned the ball over 23 times to Manhattan's 16. The Lady Crusaders will play Valley Center Friday, @ 3PM, the Hornets came up short against Olathe South 51-31. In other action, Ulysses defeated Dodge City 29-24 and McPherson downed Wichita SE, 67-39. The "CLASSIC" ends on Saturday - GO LADIES!! The Lady Crusader Basketball Team took care of business Tuesday evening vs the 3rd ranked Circle HS Lady Thunderbirds. The girls in red jumped out early on the visitors, leading 14-8 after 1. The Lady Thunderbirds battled back and by halftime, the score was nearly knotted, CHS 24 WHS 26. Like the beginning of the 1st half, Wellington came out strong and lead by "6" again after 3. And like the the 2nd qtr., the Lady Thunderbirds battled back but came up 2 pts shy of their 9th victory. (They are now 8-2). Lady Crusader (Freshman) Ali Zeka cooly drained 2 FT's with less than 20 secs. to go to take the 2 pt. lead. Moments later, a last second defensive stop by Zeka, sealed the deal and moved their season record to 7-3! When you have "4" players score in double digits, great things like this are likely to result. Awesome job Ladies!!! Awesome job Coaches!!! The Lady Crusaders have no court action slated until Thursday, January 24th, at McPherson for their "Mid-Season" tournament! Hang on to your "MO" ladies - it's going to be exciting! The JV Lady Thunderbirds were able to secure a "W", downing our JV girls 50-21. The visiting Andale Indians dominated the courts in the end at WHS Friday evening, at the Varsity and JV levels, Andale swept the Crusaders 4-0. Christmas and New Year's break was over and it was time to head back to the "courts" for the WHS Lady Crusader basketball squads. The Varsity and JV Girls continued their winning ways - here's the outcomes - next action will be Tuesday (Jan. 8) @ Wichita Collegiate!! The Lady Crusaders came up short Tuesday vs their Varsity and JV counterparts from Rose Hill HS. The Rockets held both WHS squads to under 40 pts. More action this coming Friday at Mulvane. The 2018 part of the season will conclude next Tuesday @ Winfield, just before the Holiday Break that begins Wednesday next week. It was Round #2 Thursday evening of this week's CHENEY TOURNAMENT which will culminate in Cheney this Saturday. The (2-0) JV Girls continued their winning ways from Tuesday's action in Chaparral, downing the JV Lady Greenbacks 57-44. The (1-1) Varsity Lady Crusaders ran into a hot shooting, fast moving group of girls who eventually pulled away from the home-town team for a 58-39 victory. On a side note, Head Coach Eric Adams was presented with a "100th win" game ball. This past Tuesday at Chaparral, that season opening victory by Coach Adam's squad was the 100th victory of his HS coaching career, including his first year at South Haven HS. Congrats Coach Adams, an awesome milestone indeed!! Wellington receives SPORTSMANSHIP CERTIFICATE from State 4A Basketball Tournament! Scroll Down for more info!! Congratulations to Lady Crusaders Avery Rusk and Shayland French and Crusaders AJ Snipes and Ian King - all "4" received State Honors Recognition from the Topeka Capital Journal Newspaper! Way to represent AVERY, SHAYLAND, AJ & IAN!!! We are proud of you!! Congratulations to the WHS Girls Basketball Players, Coaches, Cheerleaders and Fans! Tournament officials awarded the Lady Crusaders and their followers with a SPORTSMANSHIP AWARD CERTIFICATE - way to represent at the 4A DIV 1 State Tournament folks!! Great Job!! The Kansas State High School Activities Association, through its member schools, defines sportsmanship as those qualities of behavior which are characterized by generosity and genuine concern for others. Further, an awareness is expected of the impact of an individual’s influence on the behavior of others. Outstanding sportsmanship is acknowledged each year by presenting sportsmanship certificates, plaques and medals. All 128 high school teams participating in KSHSAA State Basketball Tournaments may qualify for an award. A “rating” system is used allowing schools to compete against a “standard of excellence”, rather than competing against one another. Schools whose teams did not advance to the semifinal rounds were eligible to receive a certificate if they met the qualifying standards of sportsmanship. Schools participating all three days of the tournament were eligible to receive a plaque for their school and medals for cheerleaders. The AVCTL DIV IV League Honors for 2017-2018 Girls and Boys Basketball were announced. These are generally not released until the State Tournaments are over - WHS has "7" players recognized by the League, "1" in a very big way. Congratulations to Senior Avery Rusk who was selected to the AVCTL DIV IV 1st Team and was also name AVCTL DIV IV "Player of the Year"! WOW Avery! Also selected to the AVCTL DIV IV Girls 1st Team was Senior Shayland French.Freshman Rylee Rusk and Junior Jacelyn Buck received honorable mention. On the boys side, congratulations to Senior Ian King and AJ Snipes who were both selected to the 1st team AVCTL DIV IV honors and congrats to Junior DeAndre Washington who received honorable mention. The WHS Lady Crusader's 2017-2018 season came to a close Wednesday evening - 4 young ladies that Lady Knight and Lady Crusader fans have followed since the 2012-2013 school year, saw their last action on the court as WHS basketball players. Thanks for the adventures Avery Rusk, Shayland French, Mekenna Adams and Gracie Fink! These "4" have to have as many or more "career victories" on the hard court than Lady Crusaders who have preceded. If not, gotta be close! Wellington, the #7 seed at the girls 4A Div 1 tournament in Salina, went up against the #2 seed Labette Co in opening evening action. The Lady Grizzlies jumped out to a double digit lead early and a scrappy and determined group of Wellington girls were able to battle back by mid 2nd qtr to only a 4 pt. deficit before Labette fired up their engines and took off again with effective shooting and ball control. By halftime, the gap had begun to build and WHS found themselves down 18-29 with 2 qtrs to go. Labette came out on fire the 2nd half unfortunately and stretched their lead to the eventual 21 pt victory in the end, (39-60) for two basic reasons, their shots were going down, the Lady Crusaders' shots were not. The Rusk sisters, Senior Avery and Freshman Rylee combined for 28 pts (14 each), followed by Senior Shayland French with 8. Junior Jacelyn Buck added a 3. As mentioned, the Big Red shooting percentages suffered,. 6/27 from the field (22%), 6/29 3 pt shots (21%). Free throws 9/14 (64%). All "9" of those FT's were made by the Rusk duo - Rylee went 8/10 from the line. Avery ended the season just "2" made free throws short of tying the WHS Season Record for "Free-Throws Made". Both drive to the paint a lot, drawing fouls with frequent regularity. This concludes the WINTER SPORTS SEASON 2017-2018 @ WHS and WMS - bring on SPRING! A nice sendoff assembly was held Wednesday morning at WHS, not only to honor the departing Lady Crusader Basketball squad who is appearing in their 3rd consecutive State 4A Tournament this evening vs Labette County! (@ Salina - 6:30PM), but also pay tribute to this year's State 4A Wrestlers, 2 of 3 who were present at the assembly. (Ian Groom, Blake Bales and not present, Matt McComb) Also spotlighted, the WHS Powerlifting team and coach. The main focus however was our State 4A bound Lady Crusaders - an awesome bunch of young ladies and coaches who play with a tremendous amount of grit and heart!. They may not be TALL but they are BASKETBALL PLAYERS nonetheless...watch for good things to happen!! Tip off is 6:30PM at the Tony Pizza's Events Center - tough competition on slate, Altamont - Labette County...it's going to be a battle - hope to see MANY FANS there to support!! WHS was the best seed but hadn't played to their full potential on Thursday in the semi-final vs Coffeyville. Ark City, being an AVCTL DIV II school (WHS is DIV IV), routinely plays larger schools at larger venues with larger and louder crowds, so a positive outcome for the Lady Crusaders wasn't a for sure thing by any means. We just knew we were 1 win away from going to the State 4A Tournament for the third year in a row so therefore this game was a must-win! Wellington continued to pressure the ball in the 3rd quarter, denying Ark City scoring opportunities and holding them to only 2 points and extended the lead out 20 pts as the 4th qtr. got underway. (39-19) The ladies in red got a little careless towards the end, allowing a brief flurry of Bulldog scoring, but it was far too little, far too late...the Lady Crusaders were going to prevail and continue to set records at WHS with their basketball prowess over the last several years. Congratulations toCoaches Adams, Strothman, Brown & Ledesma and congrats to the Lady Crusaders - awesome Senior leadership and awesome memories continue to be in the making as they head down this final stretch of HS basketball together, as they have done now for the past 6 years, initially as Knights, now as Crusaders. The ride, although almost over, has certainly been a dilly dilly journey for welly welly! Congratulations Lady Crusaders - we are lovin' this - keep it goin'!! It was opening night Thursday, semi-final action for the GIRLS at the 4A Sub-State Basketball Tournament being held at Ark City HS, featuring our Lady Crusaders (#1 seed), Ark City (#2 seed), Winfield (#3 seed) and Coffeyville-Field Kindley (#4 seed). The Lady Crusaders came out on fire, easily jumping to a 10+ point advantage early on. (1-19) Coffeyville hung around though - stretches of "cold" shooting and multiple turnovers (21) by the Lady Crusaders, meant putting the game in the "W" column for sure wouldn't happen until the last couple minutes or three of action. Wellington's aggressive defense denied Coffeyville opportunities (20 Steals) which in the end was the main foundation provider for the 9 pt victory - final score Coffeyville 41 Wellington 50. The Lady Crusaders will advance to the Sub-State 4A Championship game Saturday evening vs the host Ark City and winner over Winfield (39-36) in Thursday's other girls semi-final. A win Saturday would make this the 3rd consecutive season the Lady Crusaders advanced to the State 4A Tourney in Salina! SIDE NOTE: The Crusader Boys will see semi-final action tonight (Friday) @ 7:30PM vs host Ark City (@ Ark City HS) - that winner will advance to the Saturday Championship round (7:30PM) and will take on Friday's winner in the other semi between Winfield and Coffeyville, following the Girls Championship Game at 6PM! GO BIG RED x 2!! The Varsity and JV Girls dotted all the i's and crossed all the t's Monday evening in "make-up" action with the visiting Lady Indians from Clearwater. 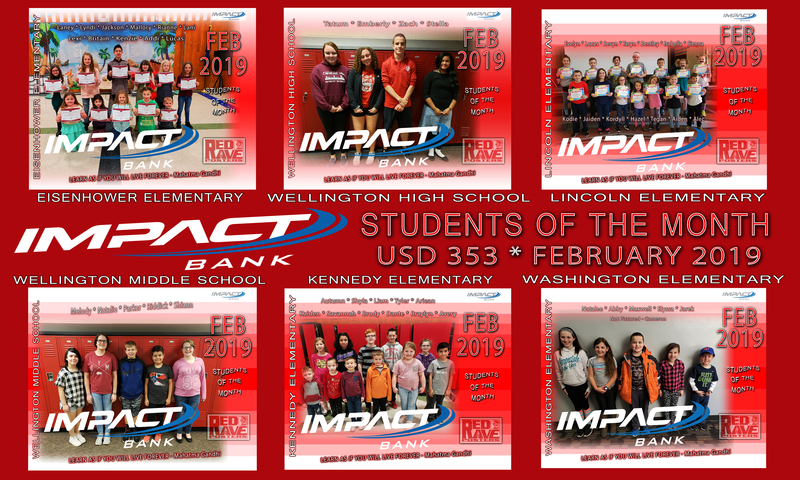 Make-up games as a result of last week's weather related postponements, went all Wellington's way Monday...the regular season ended on an excellent note across the board! CONGRATS! It was SENIOR NIGHT as well and 40 yr USD 353 employee, teacher, coach, Randy Strothman was honored for his decades of service. Randy and his wife Beth will be moving to Manhattan this summer to be closer to their children and grandchildren...Coach Stroth will be missed at WMS & WHS! Up next for the VARSITY SQUAD, 4A Sub-State action Thursday at Ark City HS. Our Lady Crusaders are the #1 seed and will face off against #4 seed Coffeyville-Kindley. #2 seed & host Ark City will square off against #3 seed Winfield. The two winners will meet up for the 4A Sub-State Girls Championship on Saturday at 6PM. GO LADY CRUSADERS! Let's return to STATE 4A action for the THIRD year in a row!! YOU CAN DO THIS! Last regular season action is on slate for Monday, Feb. 26th in a make-up event with the Clearwater Indians, postponed last week due to weather. Action on Monday gets underway at 4:15PM @ WHS, (C-Team Boys / JV Girls), followed by JV Boys @ 5:45, Varsity Girls @ 6:00 and Varsity Boys @ 7:30. Monday will be Senior Night - the Crusader and Lady Crusader Seniors and their parents will be honored in a ceremony between the Varsity Games in the main gym. 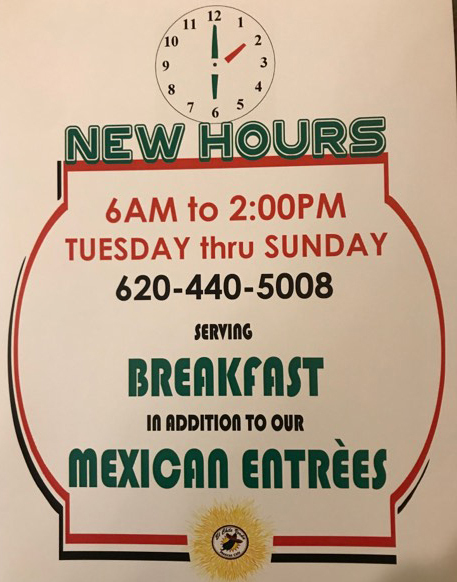 Come hungry too! The Wellington High School National Honor Society Chapter is sponsoring their annual PATTI SOBER SCHOLARSHIP FUNDRAISING TACO DINNER in the Commons beginning at 5PM! 4A Sub-State action gets underway this coming Thursday at Ark City HS, in addition to the host and the Crusaders, also on the bracket (which will come out today!) are Winfield and Coffeyville. Girls will be in action on Thursday, the Boys on Friday. Winners from those two days will advance to the Championship Finales Saturday, all the action at Ark City HS. Sub-State winners will advance to the State 4A Tournament the following week in Salina! GOOD LUCK CRUSADERS & LADY CRUSADERS! The WHS Crusaders hosted basketball action Tuesday evening vs the Rockets of Rose Hill out at WHS. The two Varsity games were nail-biters and were not decided until late in each contest. The Varsity Girls were edged out with just seconds remaining and came up short 55-58. Taylor Meyer lead in scoring with 18. The Lady Crusaders led much of the way. Down 3 with 5.4 secs to go, Wellington couldn't control the ball on the inbounds, a jump ball resulted with just over a second to go, possession arrow Rose Hill - game over. Next action for WHS will be Friday at Mulvane HS - tipoff for the C-Team Boys and JV Girls 4:15. JV Boys will follow at 5:45, Varsity Girls @ 6:00, followed by Varsity Boys @ 7:30. GO BIG RED! The Lady Crusaders, both Varsity and JV were victorious Monday evening in their "make-up" games at Winfield HS, postponed in mid-January due to weather. In Varsity action, Wellington came out on top 51-46 (9-7) (3-3). Avery Rusk lead Wellington scorers with 14, followed by Rylee Rusk and Jacelyn Buck, each with 10. Shayland French added 5 as did Taylor Meyer. Lexi Clift added 3 and Draven Warnock 2. Wellington's JV girls downed the Lady Viking 45-36 (11-4) (5-1). Lexi Clift had 13, followed by Draven Warnock with 10. Myriland French had 8, McKenna Jones 5, Kadin Brown 5, Natalie Henning 3 and Delaney Parkey 2. Off. Reb. 12 / Def. Reb. 23 / Steals 10 / Asst. Next up for the Lady Crusaders will be Andale HS, @ Andale this coming Friday, Feb. 9th. Action gets underway there at 4:15PM with C-Team Boys and JV Girls taking to the courts at that time…followed by JV Boys around 5:45, then Varsity Girls @ 6:00PM, followed by Varsity Boys around 7:30pm. Only close in the beginning, as any contest is, the WHS Varsity Lady Crusaders pulled away early from their host at El Dorado HS Friday evening, ending the night with a 4th qtr running clock, Wellington hustled their way to the 62-31 victory. The first half took about 2 1/2 days to complete. Aggressive defense by WHS (23 steals on the night) and perhaps lack of experience and ball control for the young El Dorado Wildcats, resulted in 27 foul calls during the first 16 minutes of play. It was WHISTLE-O-RAMA first half for sure. Coach Adams utilized most if not all of the bench by games' end. At one point (before halftime), there were 3 freshmen, 1 soph and 1 senior on the floor leading the charge for the Lady Crusaders. Earlier in the afternoon, in the "less round" auxiliary gym, WHS's JV Girls took on host El Dorado, in a game limited to just 2 quarters. It was a squeaker but WHS pulled down the 1/2 victory (20-18) if you will, advancing their season record to 10-2. Next action for the Lady Crusaders will be HERE @ HOME on Tuesday (Feb. 6th) vs Buhler! JV Girls will tipoff @ 4:15, followed by Varsity Girls, both in the main gym at WHS. I'm not sure what percentage of games involving #1 seeds vs #8 seeds lead to the latter's favor, Thursday night though, at the Haven Wildcat Classic, it was 100% of the time. Our 5-4 Lady Crusaders hung tight, kept their composure under the guidance and direction of some awesome coaching, refused to let an early game barrage of Wildcat 3's dampen their spirits or determination and in front of a stunned Wildcat home crowd, nailed down a nailbiting 49-46 victory, spoiling the hosts' tournament in their new and quite nice gymnasium, and forcing folks to take notice of Wellington's new and loftier presence on the tournament bracket! The Lady Crusaders played one of their best games ever, the senior leadership was what senior leadership is supposed to be - Avery Rusk pumped in 28 (her never say die attitude was in high gear), Mekenna "cool hand" Adams, calmly slammed down FT's near games' end to put the big ole bold-type "1" in the Lady Wildcats LOSS COLUMN! How sweet it was! Senior Gracie Fink even slammed down a "3" early on, her and others doing all they could to not allow the fast paced game get away. The raucous and quite confident Haven fan base and players, just couldn't put the game away and they fell silent through much of the contest as Wellington stayed within striking distance, from the mid 1st qtr until the final surge the last 5 minutes...too bad for the host. The Lady Crusaders never gave up. Juniors Jacelyn Buck and Taylor Meyer hustled, hustled, hustled and "3" WHS Freshmen saw action as well, Rylee Rusk, Draven Warnock and Lexi Clift, Rylee, a lot of action and 9 pts to boot! The Lady Wildcats shot a lot of free throws down the stretch, the Lady Wildcats didn't make a lot of free throws down the stretch. The Lady Crusaders applied pressure, the host and their crowd began to smell real trouble nearly halfway through that 4th qtr when Wellington, having been down double digit points early on, suddenly took the lead for the first time at the 5:35 mark. You could smell upset but the game would stay close until Adams calmly nailed her FT's to extend the lead to 3...the Lady Crusaders would swarm the ball and steal it away, never even allowing the Wildcats a final shot and a chance at OT. The buzzer sounded, Wellington fans erupted - the lowest seed in the tournament had themselves one sweet victory! Congratulations to Head Coach Adams, an undefeated and over confident Wildcat opponent met their match Thursday evening, the Lady Crusaders had come to play and play they did. PROUD TO BE A CRUSADER FAN - you ladies were awesome!! Next up - #5 seed Cheney (Friday @ 7:30), who easily downed #4 Nickerson to advance in the winners bracket. Cheney found great success vs our Lady Crusaders, back in early December, winning 65-39. If Cheney stuck around very long Thursday night, after their game, I doubt that game in December seems as relevant now as perhaps it once did. The Lady Crusaders are pumped and so are the fans! The AVCTL DIV III Augusta Orioles were guests of the Crusaders Friday evening out at WHS in non-league play. Proving to be spoilers to some extent, the Orioles won 4 out of 5 games at the Homecoming themed occasion.Congrats to the Girls JV squad for pulling down a convincing 53-31 victory over the JV Orioles and advancing their season record to 7-2 overall. The 22 pt win was the largest spread on the evening but the only spread with the teams in red on top. Season records continued to improve Friday evening for the Crusader and Lady Crusader basketball programs. In league action at Clearwater HS, Wellington was able to put up "4" victories in "5" games, not a bad day's (or evening's) work at all! Wellington will park the buses for a while with next week's slate showing HOME and HOME! On Tuesday, WHS will host Collegiate and then on Friday, Augusta. Also Friday (Jan. 12th), a new WHS Duke will be crowned during halftime of the varsity boys game. A very "SPIRITED" Week - Coming Up! The Lady Crusaders got the 2018 part of their schedule off to a splendid start Tuesday at WHS. The girls in red hosted the girls in green (Mulvane) and came out on top in both contests before a relatively small crowd. The temps outside quite cold and school itself is still on Holiday Break so no doubt lead to a smaller than usual fan base. The Varsity win moves their overall season record to .500, the JV Girls remain undefeated in league action! Awesome! Next up for WHS and first set of games for 2018 calendar year will be at HOME vs Mulvane Jan. 2nd! MERRY CHRISTMAS!!! It was AVCTL DIV IV league opener time Tuesday for our Crusaders and the Indians of Andale. The WHS varsity boys were 1-2 and varsity girls 2-1 going into Tuesday's action HERE at home in front of a small to medium sized week night crowd. It was a split of sorts between the JV squads and Varsity squads. Andale won the latter, Wellington the former. All of the games were competitive and for the most part not clearly decided until late in the games. (Our JV Girls however did dominate the action throughout). Next up for WHS and final set of games for 2017 calendar year will be at Rose Hill this Friday. GOOD LUCK BIG RED!!! The Lady Crusaders ran into several defensive and offensive buzz saws Thursday evening, playing host to Cheney HS who is the actual host (of the Cheney Invitational), which has played itself out at the participant's schools, 2 of the last 3 nights this week. The 3 day round robin tournament will conclude this Saturday at host Cheney and they will be hard to beat. As noted above, the 3 day invitational concludes on Saturday. The Varsity & JV Lady Crusaders will take on Chaparral. Action for Wellington will begin @ 2PM @ Cheney HS with the Varsity Girls and JV Boys tipping it off. Following those 2 games, the Varsity Boys and JV Girls will take the stage. Here are the 2017-2018 Lady Crusader Basketball team members! Incoming Freshmen thru Senior Girls for 2017-2018 school year attended in good numbers Tuesday at the 1st day of 4 slated for this summer's HIGH SCHOOL GIRLS BASKETBALL CAMP! The MIDDLE SCHOOL CAMP follows each day this week as well...hope to have pics from that to share before week's end! Again, good turnout today and Coach Adams, Coach Strothman and Coach Brown got down to business...here are a few pics from CAMP DAY 1! STATE 4A GIRLS BASKETBALL UPDATE Wellington 49 Bishop Miege 63 Lady Crusaders season ends at 17-6 WE ARE PROUD OF THESE YOUNG LADIES! 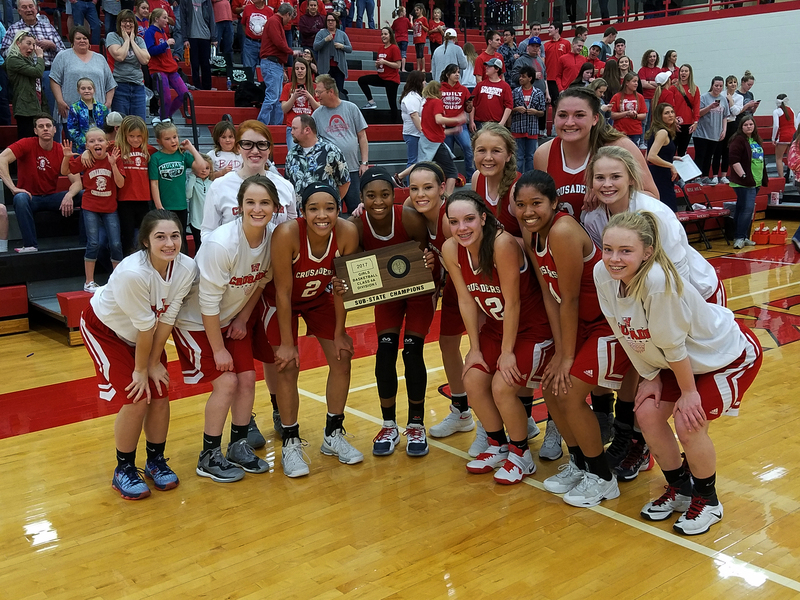 The WHS Lady Crusaders' desires to return to the STATE 4A TOURNAMENT in Salina for the 2nd consecutive year was tooooo much for the Lady Rockets of Rose Hill to overcome, even on their home court Saturday evening in the 38-35 WHS, 4A Sub-State Championship Final Game. A close game throughout, fraught with foul problems at times, the never say die Lady Crusaders held on for a close 3 pt win to advance (again, for the 2nd consecutive time) to STATE 4A TOURNAMENT action in Salina commencing on Thursday of this coming week. #6 seed Wellington vs #3 seed Shawnee Mission Miege @ 8:15PM / Tony's Pizza Event Center. Scoring honors go to both Avery Rusk and Lauryn Snipes, both with 13. Clutch free-throw shooting by RUSK down the stretch sealed the deal for Wellington's trip north next week. Shayland French had 7 pts., followed by Jacelyn Buck with 3 and Tayland French with 2. A large contingent of Crusader Fans were on hand for this game (and the boys game) - the crowd erupted at the buzzer - we're going back to SALINA!! It was semi-final action at 4A Sub-State in Rose Hill Friday evening for the Lady Crusaders, Lady Vikings, Lady Rockets and Lady Wildcats. In the opener, our very own WHS Lady Crusaders pulled away in the 2nd half vs Winfield, much like the Crusaders on Thursday did vs Rose Hill. Up only 4 at half, the Wellington girls Friday doubled their score by 3rd quarters' end and added another 15 down the stretch to defeat the Lady Vikings and send them packing for another year, final score Wellington 57 Winfield 38. In the nightcap Friday, host Rose Hill downed Mulvane 48-24 to advance and meet up for the 4th time this season with the Lady Crusaders on Saturday in the SUB-STATE 4A CHAMPIONSHIP GAME beginning at 6:00PM at Rose Hill HS. 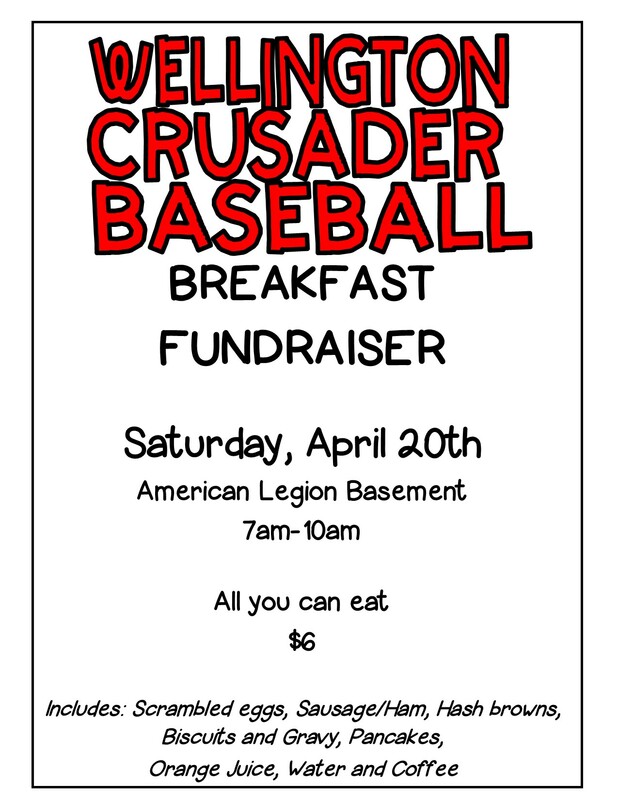 Following that game, it will be Wellington's Crusaders vs Mulvane's Wildcats! (also for the 4th time this season) The winners of these two games Saturday advance to the STATE 4A BASKETBALL TOURNAMENT next week in Salina. Wellington could have two teams at the State Tournament, which would be the 2nd year in a row for the Lady Crusaders and the 2nd time in 3 years for the Crusaders to make State appearances. In the Wellington vs Winfield contest, the Lady Crusaders jumped out to an early lead but the Lady Vikings battled back and were within 4 pts. when the 1st half buzzer sounded. After the break though, Wellington exploded offensively, outscoring Winfield 22-10 in the 3rd and 15 -10 in the final qtr. The Lady Crusaders had "3" in double figures: Avery Rusk 18, Shayland French 12, Lauryn Snipes 12, Tayland French 8, Mekenna Adams 3, Jacelyn Buck 3, Chloe Wilson 1. The win advances the Lady Crusaders to 16-5 and sets the stage for another possible trip to the State 4A Tournament next week. CRUSADER HEARTS are beating strong - GO BIG RED! The Varsity Lady Crusaders came to play Friday night and controlled the tempo for nearly the entire game. With a margin of 8 pts. at half, Wellington would sustain and add to that down the stretch to avenge their earlier season loss by 5. Final score this time around Wellington 47 Andale 35. An awesome job by the Lady Crusaders who move to 12-4 on the season. "3" Lady Crusaders were in double figures, Lauryn Snipes pumped in 16, followed by Tayland French 12 and Avery Rusk 11. Shayland French and Jacelyn Buck both added 4. The WHS Lady Crusaders battled hard Saturday in day #3 at the 44th annual Haven Wildcat Classic at Haven High School...after a a big 2 OT win on Thursday vs Rose Hill and an unfortunate loss Friday to Cheney, the LADY CRUSADERS rebounded in the 3rd place consolation game vs Kingman and won by the final score of 40-38. The Ladies had to battle back in the fourth qtr from a 28-32 deficit after 3 qtrs to secure the 3rd place finish and came home with a 2-1 tourney record and now 9-4 on the season. The squad will have nearly a week off to prepare for more action on Feb. 3rd here at home vs El Dorado. That night will also be HOMECOMING with the DUKE CORONATION following the Varsity Girls game in the main gym. CONGRATULATIONS LADIES - KEEP IT ROLLIN'! WHAT A GAME!! The Lady Crusaders downed previously undefeated Rose Hill in 2 OT's - Final Score 55 - 52! Last second shots by Lauryn Snipes in both OT's - in 2nd OT, it was a long "3" for the WIN!! NEXT UP - Cheney @ 7:30PM Friday! 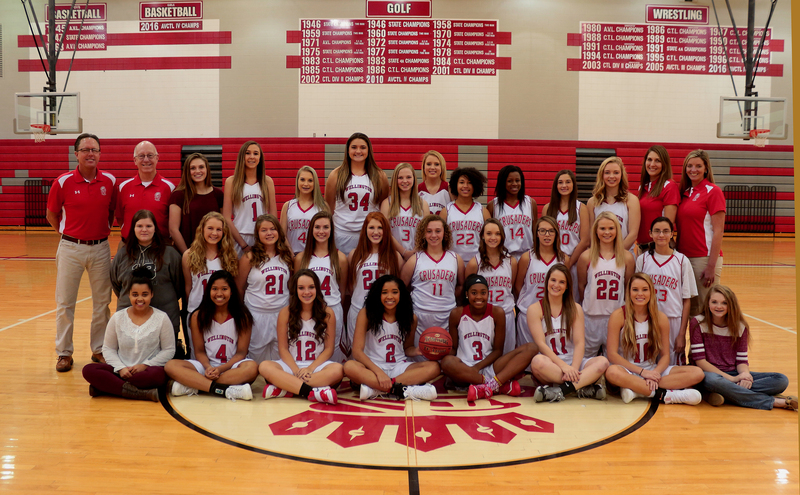 In a contest much closer than the score would indicate, the Lady Crusaders are off to a 1-0 start on the 2016-17 basketball season, downing Conway Springs in round 1 action at the 15th annual Kingman Eagle Classic, 46-39. Wellington trailed the Lady Cardinals at halftime 18-19 but a strong 4th qtr rally secured the victory. Scoring: Lauryn Snipes 16, Avery Rusk 14, Shayland French 12, Tayland French 4 // Next up - HAVEN HS @ 3:00PM Friday (@ Kingman) SIDE NOTE: The JV Girls came up short against Conway Springs 42-27! Thursday was MEDIA DAY at WHS / the 2016-17 Boys Basketball, Girls Basketball and Wrestling squads were in official game/match attire and the camera's clicked away. Here are most of the GIRLS BASKETBALL PICS!